So, the end of the year is very near! Today is Friday, 28th December 2012. This afternoon I’m going to play Rummy Cub as well as Scrabble with Irene and Erika at Erika’s place. Marion, who usually plays with us, is still up north in Ballina. I remember Ballina. It’s a beautiful little town not far from the Queensland border. That reminds me, Baby Lucas is at present up north too. Peter just noticed a picture of him on his Mum’s arms in front of the Big Banana in Coffs Harbour! His Dad and Uncle are with him too. It’s his first holiday away from home! Tomorrow Peter and I are going to Wollongong. We’re invited for coffee and cake to our friends’ place in Wollongong. They are very longtime friends. We first met them in Balgownie Hostel in 1959! 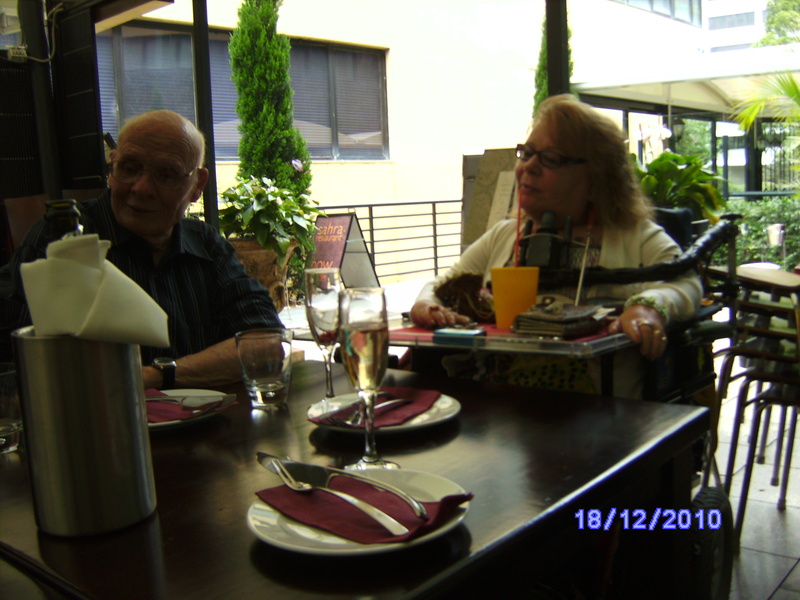 They had come from Germany to Australia on the CASTEL FELICE half a year before we arrived in Australia. They had a 20 months old daughter, so had we. 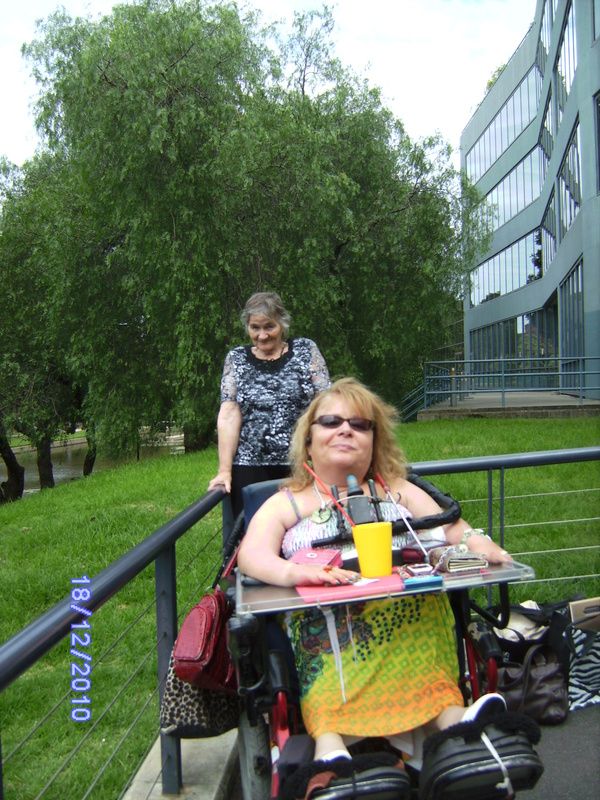 This daughter, who is 55 now, came to see us in Berlin and she said her parents live in Wollongong now. Well, surprise, surprise, this is only a few minutes away from where we live! 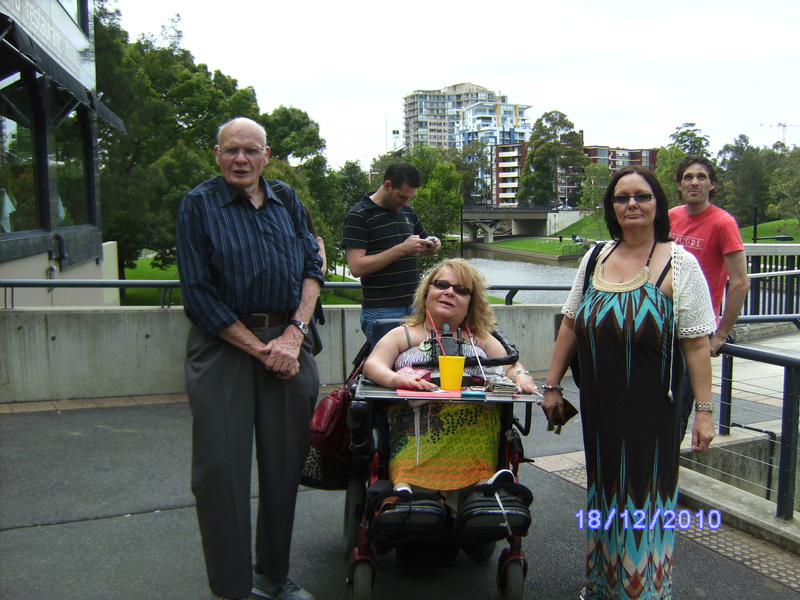 So Sylvia, the daughter, arranged for us to meet her and her parents in Wollongong tomorrow. We are very much looking forward to this! Sylvia is also corresponding with our daughter Monika, who is one year younger than Sylvia. She remembers also our son Martin and our daughter Gaby – – – – who would be 55 now, but sadly is no longer with us. On Sunday I might get a chance again to go to Mass. Last time I went was on Christmas Day, Tuesday, the 25th, early in the morning at 7,30. It had been a beautiful Mass. Instead of a choir we had four young people playing their instruments. On Christmas Eve it had cooled down already quite a bit after a heat wave of around 33 Degrees Celsius. The celebrations on Christmas Eve went very well at our place. Ebony and Ryan did bring Baby Lucas along. All in all there were 14 people at our place. Daughters Monika and Caroline with some help of Matthew saw to all the catering. Peter read out a story he had written about our life in December of 1957. Everyone was very interested to hear a bit more about what we had been up too. On previous Christmas Eves Peter had been telling about earlier Christmases from his childhood. They always want to hear more stories about these early years. This year we had told everyone to bring only one Christmas gift. 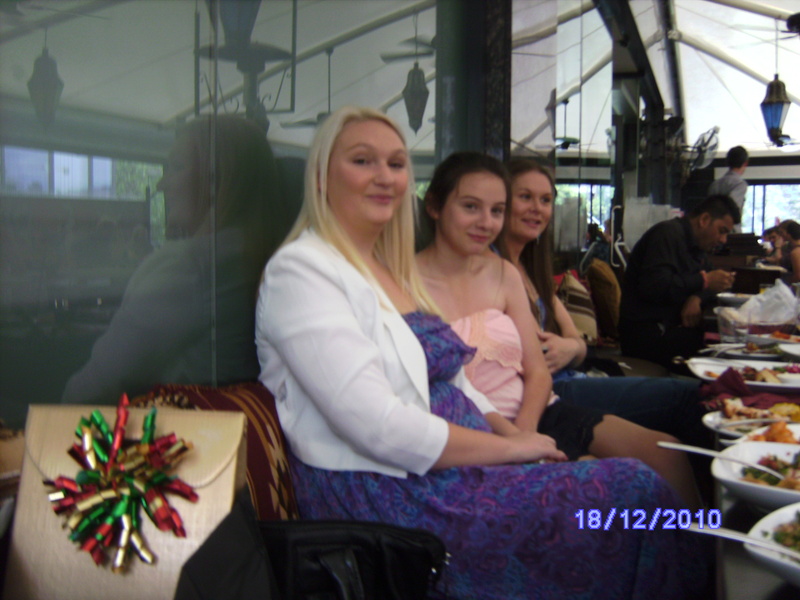 Monika and one of her daughters had randomly chosen the names and worked out who was going to buy a gift for whom. We suggested everyone should spend only ten Dollars on their present. I think on the whole people stuck to this. Maybe a few people spent a little bit more. Baby Lucas, this Christmas being his very first Christmas, did get a few extra gifts. Nobody actually was to know who their present was from. On the labels was written the receiver’s name plus: ‘From secret Santa’ or ‘From Santa with Love’. Peter was chosen to hand out the gifts in the name of Santa. While the gifts were being handed out quite a few jokes were made. Everyone was having fun! So now New Year’s Eve is near. The last day of the year is to be next Monday. Peter and I have planned to travel by train to Sydney on that day and spend the day in Sydney but be back home in the evening. Of course there are going to be big fireworks again at Sydney Harbour. People are reserving themselves spots near the harbour already the previous night! We prefer to spend New Year’s Eve at home and watch some of the going ons on television. By the way Christmas Day and Boxing Day we were home all day. It had cooled down very much and was raining a lot. We played games with Caroline and Matthew, listened to music, watched a few DVDs, talked and relaxed. For food we had a lot of left overs! Plus Caroline made us yummy scrambled eggs. On Boxing Day we had soft boiled eggs for breakfast and Caroline provided a very well cooked meal for lunch with roasted duck, (falafel for me). kale, baked sweet potatoes and baked potatoes. I made some red cabbage, which everyone loved also. We also had mangoes, nectarines, bananas, lots of sweets and German ‘Lebkuchen’ and ‘Stollen’ as well as beer and wine, cups of tea and espresso. It was a very relaxing joyful Christmas. And now, wishing everyone a very HAPPY NEW YEAR 2013! Just heard the news: Today is going to be the hottest December day in seven years! So far I love this warm weather. We’ve just been out in our ‘jungle’ garden. At present some sections of our backyard look a bit more tamed. We discarded the overgrowth in some of the sections and planted a few new things. Because of the rather warm temperatures we are careful to give the new plants sufficient water. They seem to love it and reward us by looking very healthy. The outside areas of the church were pleasantly lighted. A number of lovely wooden seats invited people to sit outside. I rested on one of the seats, enjoying a light cool breeze. In the church it got more and more sticky while the hearing of confessions went on. Each priest had been placed in a different section for the hearing of confessions. Most people took only about a couple of minutes to get their absolution via the priest. Catholics are good in believing that sins can be forgiven. I am a good Catholic too in this regard! This afternoon we are off to Figtree again. Peter has another eye examination scheduled. And then tomorrow is the big day: Our excursion to the highlands! Our 56th Wedding Anniversary is coming up. Last year we had an early celebration of our anniversary. 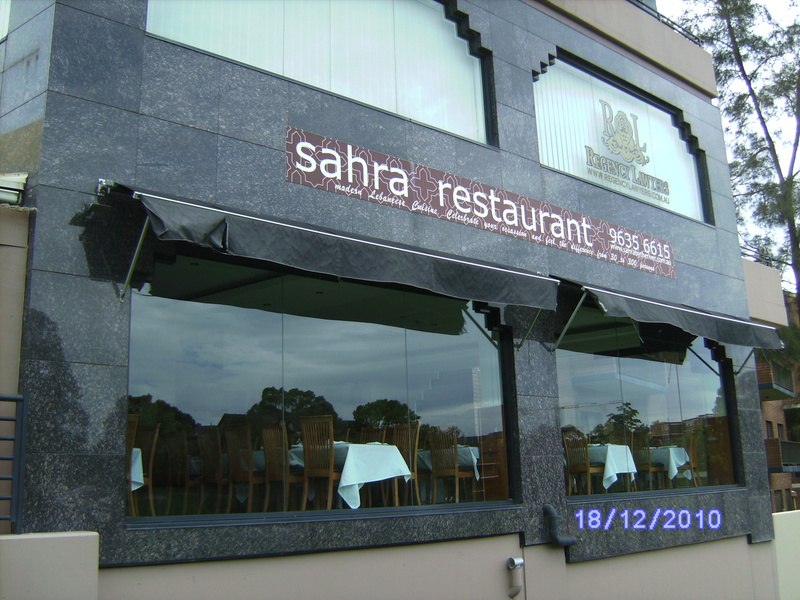 We invited the family on Sunday before the anniversary to have a banquet lunch with us at the sahra restaurant in Parramatta (Sydney). It was a day to remember. Gaby was still with us then. We saw Gaby again three days later on Wednesday, the 21st of December 2011. 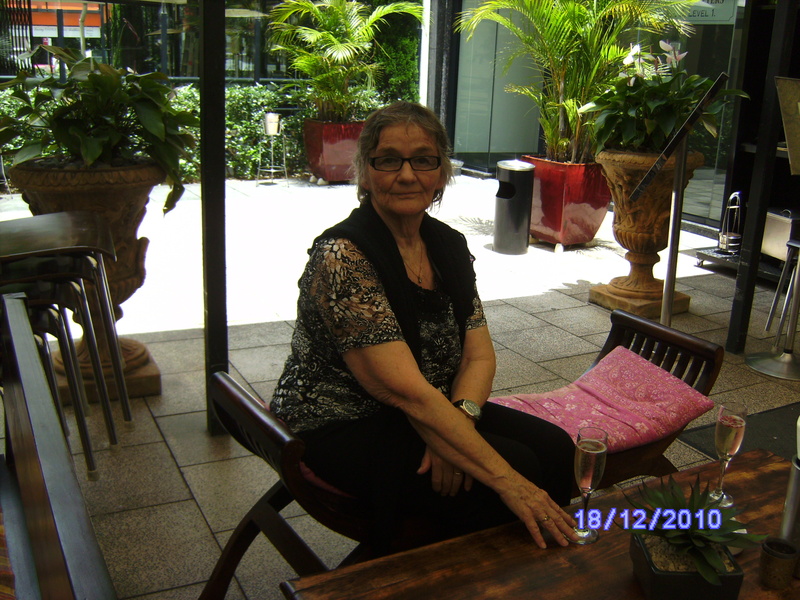 We met her at Merrylands Shopping Centre. Our daughter Monika came to meet us there too for she hadn’t been able to come to the banquet on Sunday I was so happy that both Caroline and Gaby could be with us on the 21st of December. 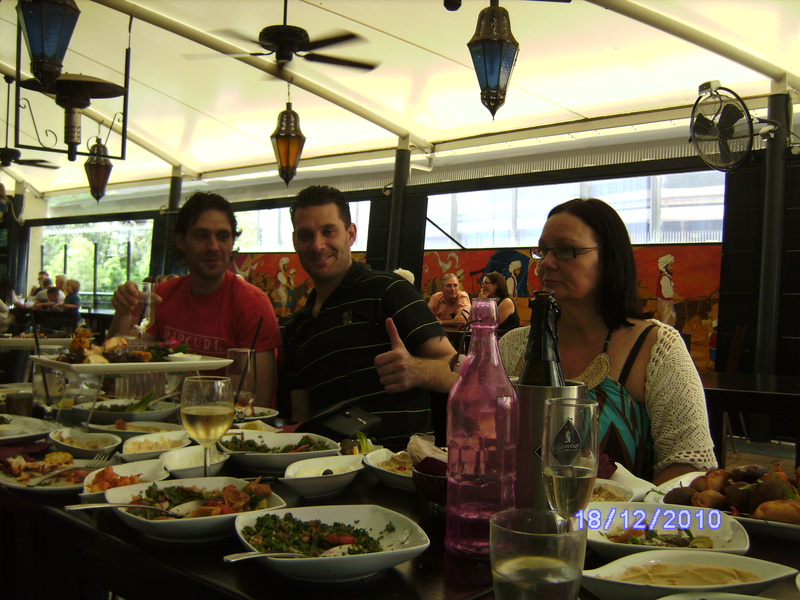 On the 23rd of December, a Friday, we traveled by car to Melbourne to spend the Christmas days there with our son Martin. After the Christmas days we left with Martin and his daughter Lauren in his rented car to go along the Great Ocean Road to Apollo Bay to spend one week there in a holiday cottage. Kristan and her mum Margaret spent also the holidays with us. It was a great holiday. A lovely surprise for us was, that Martin’s son and daughter-in-law were able to visit us for one day at Apollo Bay and they did bring their two little sweet daughters (our great-grandchildren!) along. This year Peter and I are going to take off by ourselves on our special day. We’re very much looking forward to this! We plan on going up to the Highlands for the day and to spoil ourselves with a nice luncheon and later on afternoon coffee at a very special place! So this Friday is the day we are looking forward to. We kept ourselves pretty busy the last few days. So time passed quickly. And then of course there’s is Christmas to be looking forward too. This year Christmas Eve is open house at ours. Up to sixteen people might spend the evening with us. It’s good to be able to celebrate Christmas with family! Here is now what I wrote last year about our wedding anniversary. As I pointed out then, the pictures were of course taken in 2011 (not 2010 as it says on the pictures). 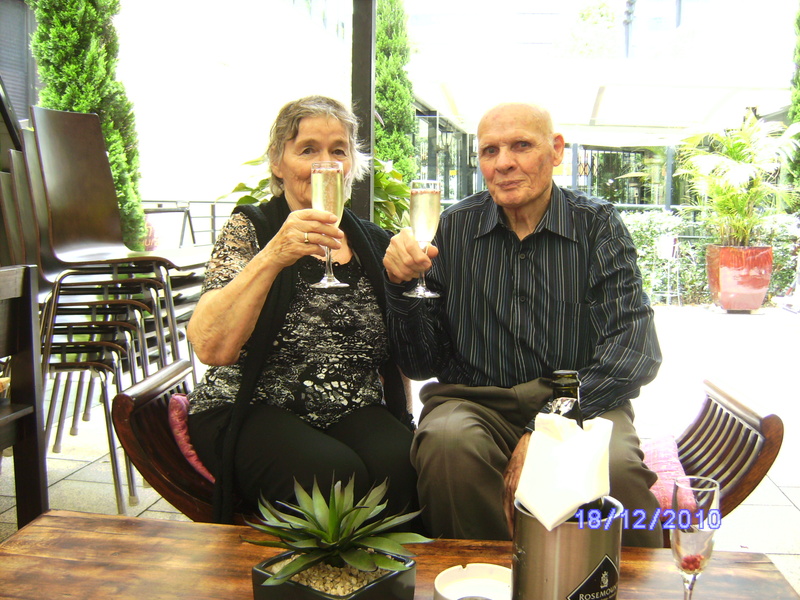 On Sunday, 18th December 2011, we had the banquet for our 55th wedding anniversary. Two daughters and five children of one of the daughters joined us at the restaurant. Three more people, who originally wanted to come, could not make it because they had to work on this Sunday before Christmas. 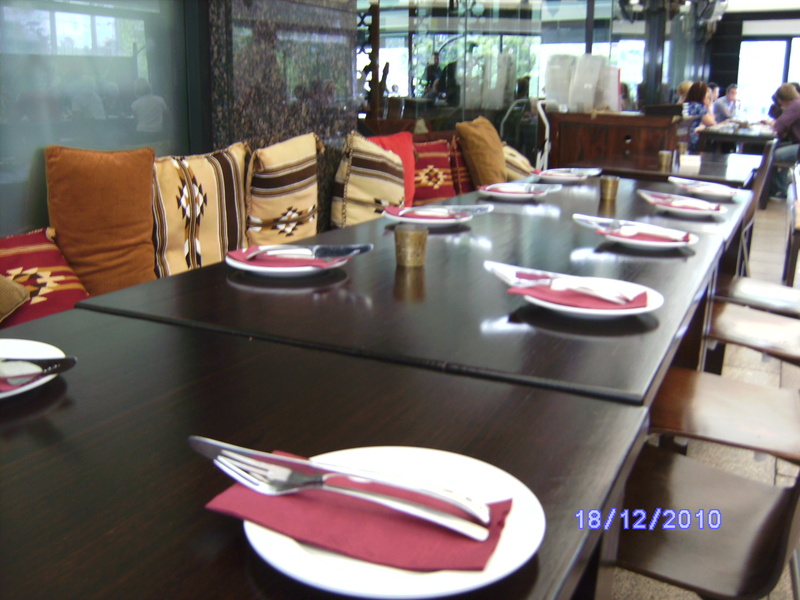 The restaurant was Lebanese. 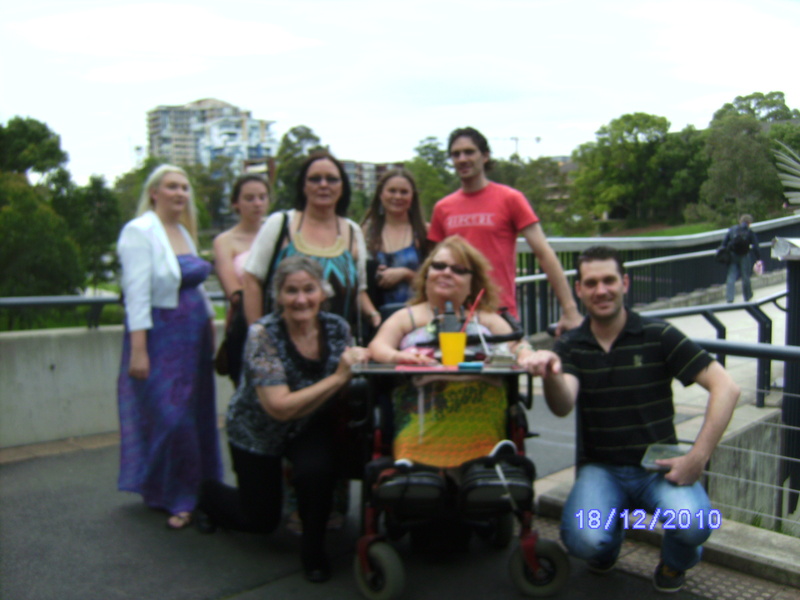 It is situated close to the Parramatta River in Sydney. 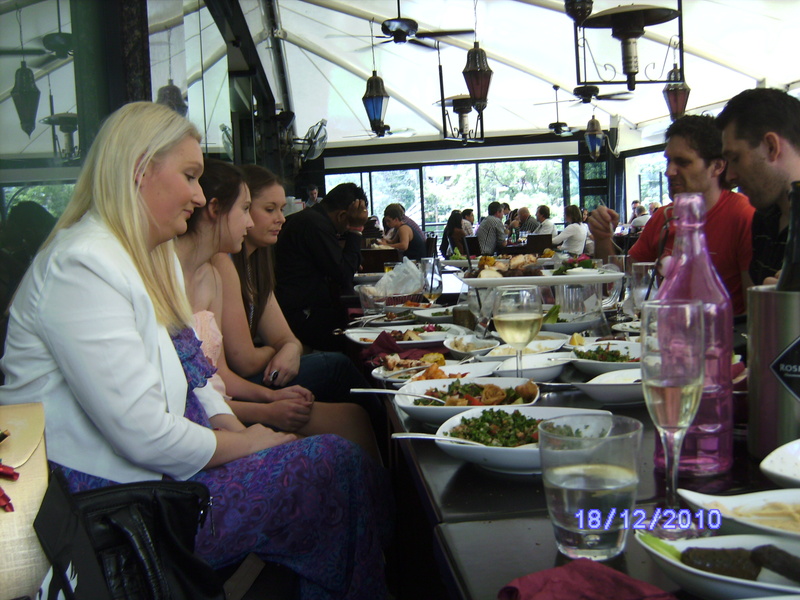 We took photos outside the restaurant near the river and also inside where all the delicious food was served. The camera was set onto the wrong year. It should of course say 2011, not 2010. The Main Tropical Greenhouse promised Tropical Plant Diversity. It was diversity all right in such a huge building, going upstairs and downstairs a lot. After that lovely walk we had through the gardens of course I didn’t want to miss out on this beautiful greenhouse to top it all. The greenhouses were truly magnificent, but gee, was I exhausted in the end. And thirty. What about some refreshments? There was an outside area were lots of people were sitting with drinks and cakes. We sat down too. To get refreshments. you had to queue up. Our friend volunteered to get something for us. I asked her to get me a beer, please, instead of coffee. This beer turned out to be the right kind of refreshment for me. I felt immensely refreshed after I drank it. As I said in my previous post it was Saturday, 20th October this year (2012) when we visited the Botanic Gardens in Berlin with our dear friend. Peter, my husband, took many more pictures on that day. So I can publish a few more now. Most of the previous pictures were taken by Peter as well. Obviously someone had been very creative with the writing on these bins! Peter and I have visited quite a few Botanic Gardens in a lot of different cities but somehow we had never made it to visit the Botanic Gardens in Berlin. On Saturday, October 20th, this year we finally did walk through these gardens in Berlin. A dear friend of ours came along with us.